A majestic arrangement designed with passion. It is front view only. 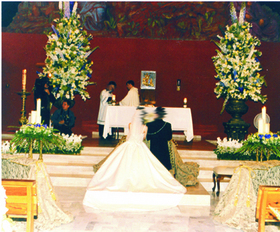 Description:One very impressive altar arrangement, on large urn (that is included for rental). It measures at least 9 foot high. It includess Lilies, Delphinium, Agapanthus and Glads, plus several greens and accents to add to its majestic view.